Show Me Your Muffin and the giveaway winner! To check out the winner of the giveaway, please scroll down to the bottom! I am here with the next edition of "Show Me Your.. " series. After breakfasts, cakes, omelettes, lunchboxes, curries, fridges, wholegrains, cookbooks, salads, sandwiches, smoothies and soups it is MUFFINS this time! Muffins have always been our favorite be it plain ones to ones with nuts and chocolate! They are great finger foods and even make a wholesome breakfast. So get out your aprons and baking pans and start baking your muffins. Send them across for this event. Some guidelines for the event. Create a blog post featuring your muffin recipe. Please link back to this announcement page. Eggs are allowed in recipes. Archived posts are allowed if you provide a link to this announcement page. 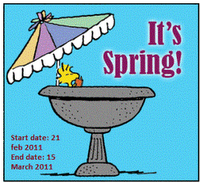 Email your entries to divyablogs[AT]gmail[DOT]com on or before April 30, 2011. And the lucky winner of the CSN giveaway chosen randomly is..
Swapna of Simple vegetarian Recipes! Thanks everyone for participating and sharing about your favorite cookware! This is a special giveaway for readers here at Dil Se...! What is your favorite cookware? I am a big fan of pan sets which range from non-stick ones, stainless steel and copper pans. 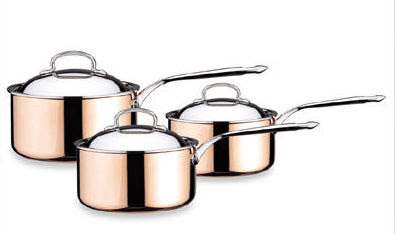 I happened to find these beautiful Tri-Copper Pan Sets in the CSN Stores Website. Don't these look beautiful? Would you like to win this giveaway and buy your favorite cookware for your kitchen? You have the opportunity to win a gift card and choose your favorite cookware from their online stores. Leave a comment in this post, telling what is your favorite cookware. For extra entries, follow my blog publicly, in a reader, subscribe by email, like the site's facebook page and leave a comment for each entry right here in this post. I will be choosing the winner on the March 21, 2011 using a random integer generator. This my final salad for this blogging marathon. I used store bought basil pesto for this salad. But it can be made in a snap at your kitchen. Check out my spinach-basil pesto recipe! I made this salad with olives and cherry tomatoes. It turned out to be very similar to my whole-wheat pasta salad except for the pesto dressing. You could make a whole batch of pesto and store it for weeks and make all kind of favorite pastas and pizzas with it. This was my quickie lunch this afternoon..
Cook the pasta according to the manufacturer's instructions. Since I do not like my salads to be warm, I rinse the pasta in cold water after cooking. Drain the water from the cooked pasta. Combine the pesto, salt, pepper and lemon juice to the cooked pasta and mix well. Add the cherry tomatoes and sliced olives to the pasta. Plate the salad and add some freshly grated parmesan cheese on top.. Check out the bloggers doing the Blogging Marathon, along with me.. It is seven days of salad here at my place! This is the fifth salad of the week! After looking at a lot of salads ranging from veggies, to pastas, to wholegrains, I wanted to make a fruit salad for today! I chanced upon this fruit salad and I liked the Indian touch to the salad. I made this after lunch and it was a guilt-free treat! I like the addition of fresh mint which gives a whole new flavor to the fresh fruits. The fruit chaat and the kala namak render their all-indian touch! I made this with fruts available in my pantry and the fruits can be varied according to the availability by season. Chop the fruits into bite sized pieces. Drizzle the lemon juice and mix well. Sprinkle the kala namak and chaat powder as per your taste and garnish with fresh mint leaves. This is one of the delicious salads I discovered thanks to the blogging marathon! I have chosen salads as the theme for the blogging marathon and when I was looking for new salad recipes, I came across many cabbage salad recipes. I adapted several recipes and this salad has been my favorite to date. I customized the recipe using the ingredients in hand and I believe it would taste more Asian if sesame oil were used instead of the olive oil. I like the color combination of the purple and napa cabbage. The napa cabbage could easily be substituted with green cabbage. The dressing is kinda sweet due to the addition of agave nectar and it makes the strong cabbage flavor subtle. Whisk together all the ingredients for the salad dressing. Chop the cabbage evenly and place in a bowl or salad plate. Add chopped cilantro and grated ginger. Drizzle the salad dressing on top and toss well until combined. When I came to know that this was March's Sweet Punch bake, I immediately knew i was going to bake these cookies. They came together in a jiffy and uses day-to-day ingredients always available in my pantry. They can be made just before tea or when you have sudden guests. Even though it uses simple ingredients, these cookies taste exotic with aromatic cardamom in them. I used a little more almonds than mentioned in the recipe and it gave a nice crunch to the cookies. I served them with tea and they got over in no time! In a bowl, mix the flour, sugar, salt, sliced almonds and cardamom powder well. Place the dough balls on an ungreased cookie sheet about inch a part. This salad is made using Quinoa. I have always been skeptical to try new ingredients. However, reading about the health benefits of quinoa, I wanted to include it in our meals, and this is what I made. I picked up a pack of quinoa from Trader Joes and it has been lying around for a while. I knew I had a to make a salad with it for the blogging marathon. This salad was delicious and so easy to put together. I have used ingredients I had in my pantry. They can be substituted easily since this is a fool-proof recipe. Cook the quinoa with two times water or according to package directions. This is the general procedure to cook quinoa - Combine the required quantity of quinoa with two times water in a saucepan and bring it to a boil. Simmer, cover and cook for about 8 to 10 minutes until all the water has been absorbed. Fluff with a fork and allow it to cool. Meanwhile prepare a dressing with the lemon juice, olive oil and salt by whisking them together. Drizzle the dressing over the cooked quinoa and mix until well combined. In a salad plate, transfer the quinoa and top with the dried fruits, nuts and fresh herbs of your choice. This is a simple summer salad which takes less than five minutes to put together. And the five minutes include the time of cooking the pasta. I like to chill the salad and have it for lunch. I hate preparing elaborate meals when it is only me being the person who eats. This is a to-go meal for me, when I have to prepare lunch only for myself. I make these type of salads when hubby has lunch at office and I need to make a quick lunch for myself. I used cute little cherry tomatoes and fresh mozzarella cheese from Trader Joes. Ordinary tomatoes can be chopped and substituted in this salad. Also mozzarella can be replaced by other cheese like paneer, cheddar, feta, goat cheese etc. Cook the pasta in boiling water according to the instructions in the packet. Drain the pasta and allow it to cool. Chop the basil and mint leaves finely. Combine the pasta, tomatoes, cheese and the dressing together. Drizzle the dressing an toss. This is a quick salad to put together and is a crunchy and tangy salad. It uses apple as the main ingredient and is a forgiving recipe. The remaining ingredients can be modified with available ingredients in the pantry and refrigerator. It uses a simple mayo dressing. Great salad to have especially on a hot day! Chop the apples, celery and walnuts. Whisk together the mayonnaise, lemon juice, all-spice powder, salt and pepper. In a bowl, combine together the lettuce, apple, celery and walnuts. Drizzle the prepared dressing on top and toss. Other possible variations - pears, raisins, dried cherries, cranberries, pistachios, walnuts etc. Check out the other fellow bloggers doing this blogging marathon . Blogging Marathon is back!! I did a similar blogging marathon almost two years back. It was fun and I made a lot of new friends in the blogosphere. The previous marathon lasted for a month(Phew!!) but this one started by Srivalli is for a week and based on a theme. I have chosen the theme salads and I will be posting a salad recipe everyday the coming week! Let's Chop, Chop.. This is an interesting salad made with fresh spring ingredients like asparagus and avocado. A great way to welcome spring, and a great healthy way to start your lunch!! In a bowl, combine all the dressing ingredients and whisk together. Trim off the tough stalks of the asparagus, then boil the remaining stalk of the asparagus until just tender and bright green. Plunge the asparagus into cold water to halt the cooking time and still hold the bright green color and drain well. Set the asparagus aside to cool. Combine the asparagus and the avocado and drizzle lemon juice on top. Add the soy ginger dressing and toss. Add fresh herbs on top if desired. Check out my fellow bloggers who are participating in this blogger marathon! Harini, Jay, Kamalika, Padma, Pavani, Priya Madhavan, Priya Suresh, Suma, Vatsala, Veena, Ila Nila and Priya Vasu. After reading about all the benefits of brown rice lately, I picked a pack of brown rice during one of our weekly grocery shopping. As usual it was ignored in my kitchen. I have hoarded a lots of stuff similar to this - oat bran, wheat bran, steel cut oats, flax seed, flax seed meal, almond butter, chia seeds are some of them. I get all these healthy ingredients when I read all the health benefits, try them in any one recipe and then just hoard them. I was trying to clean my kitchen, fridge and freezer and I was just amazed to look at the huge list of ingredients I have stashed in there. In an attempt to finish up all those ingredients, I started with this brown rice adai. Any suggestions for dishes made with the above ingredients are welcome!! The brown rice adai sure turned out delicious and it made a great weeknight meal. I soaked the pulses and rice in the afternoon and the adais were whipped up in a matter of minutes. I used sprouted moong dal which I had on hand. This can be replaced with regular moong dal or any other beans. There is no need to ferment the batter. The adai can be made immediately after grinding. I served them along with some onion chutney. Soak the pulses and the brown rice together for atleast 2-3 hours. Drain the water. Combine together all the ingredients in a blender and grind to a smooth batter. Add little water if required. the batter should be of pourable consistency. To make the adai, heat a dosa pan, and add a ladle of batter in the center and then spread in circles with the help of the back of the ladle as you would make dosas. Drizzle a teaspoon of oil. After a minute, flip the adai and allow the other side to cook. Remove from the pan and serve the crispy adais with a chutney of your choice. Sending this to WWC Brown rice for Dinner hosted by Siri.